"Diversion" is the 88th Mandrake Sunday story. The story was written by Lee Falk and drawn by Phil Davis. 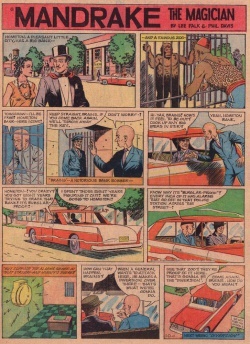 The story title is taken from the strip of September 24 and October 1, 1961 (Next Week: "Diversion"). In this story it looks like Mandrake, Narda, Lothar and the Police Chief live in Hometon. This page was last edited on 1 January 2019, at 12:10.